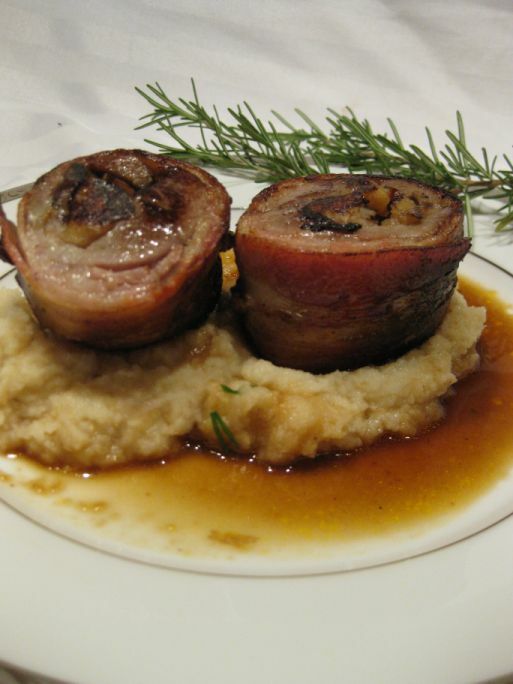 This duck recipe is hearty and yet sophisticated. 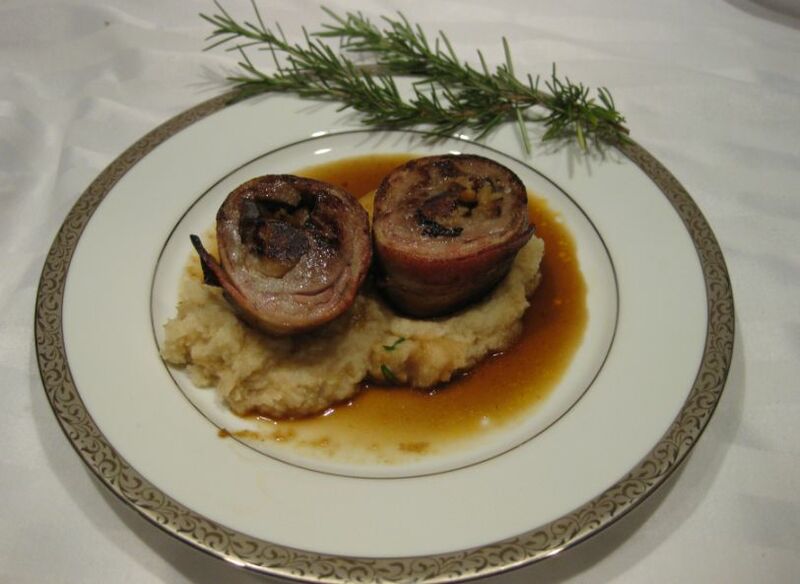 The duck skin is replaces with thin slices of apple wood smoked bacon, which keeps the duck moist and allows you to stuff the breast with a tempting combination of braised apples and chestnuts. The result of this effort is neat little package that, when cut, reveals a mosaic of stuffing, that holds all the earthy flavors of fall. 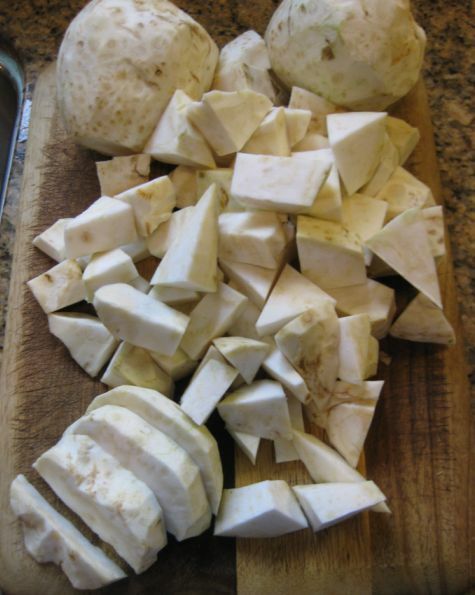 Celery root is at its sweetest in the fall and winter and makes a rich, delicate puree, combining with the deep flavors of bacon, apples, chestnuts and duck. 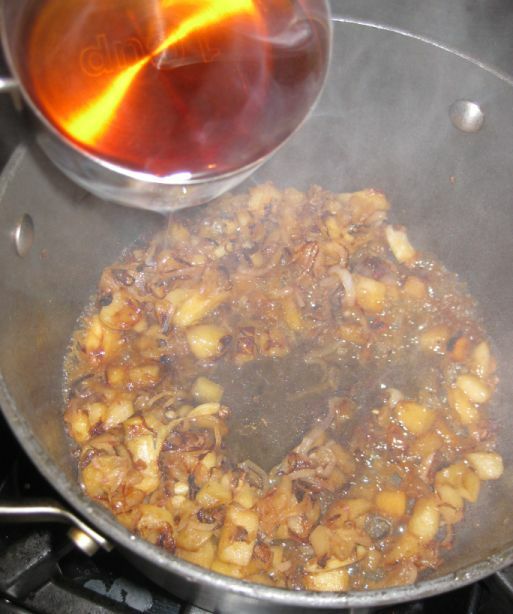 A reduction of brandy is added to the sauce and pulls all of these ingredients together. 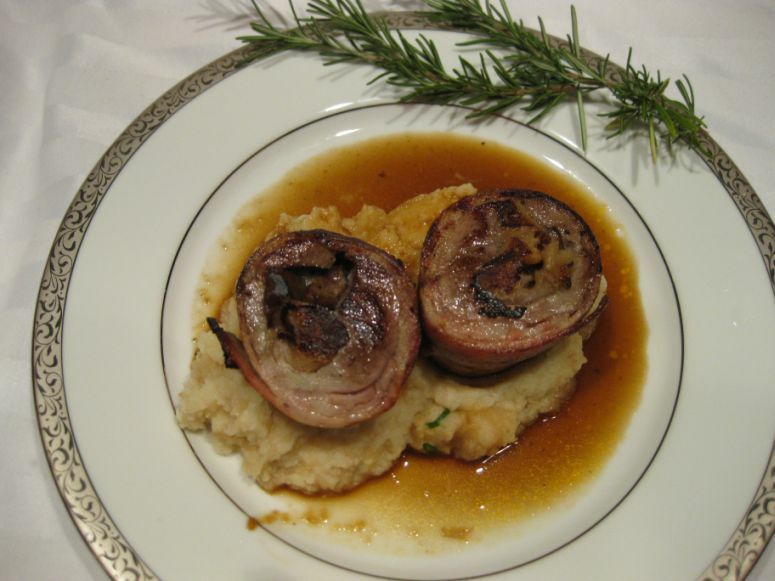 Here is the presentation of the dish. The puree of celeriac is just amazing! 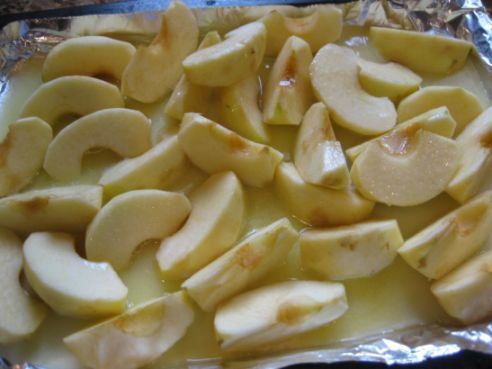 Spread the apples out on a baking sheet and roast, stirring frequently for 20 minutes. 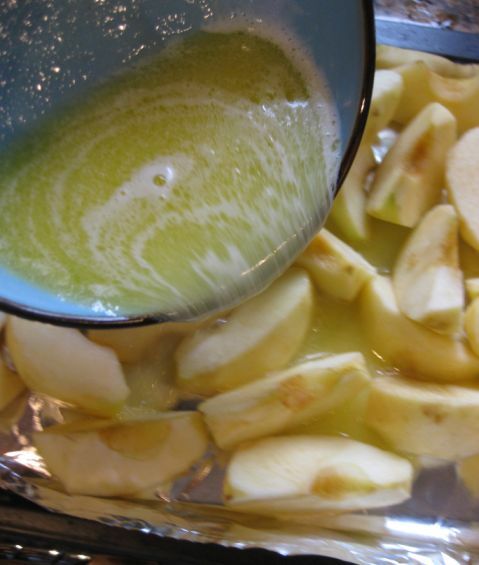 Remove from the oven when the apples are soft and most of the water and butter have been absorbed. 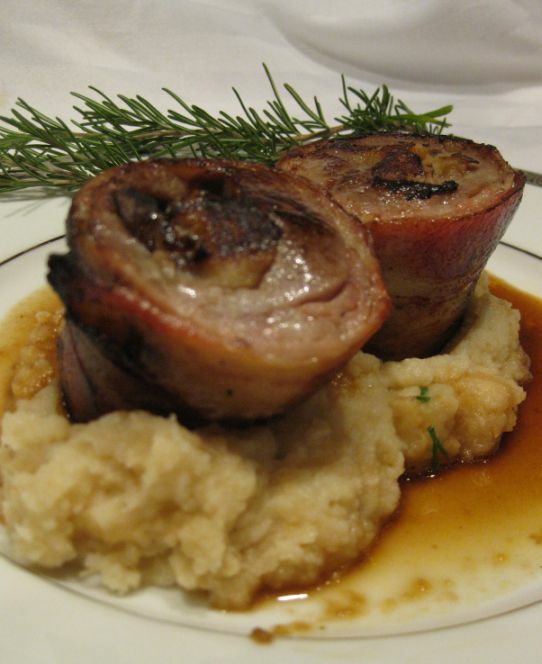 Add the thyme and set aside. 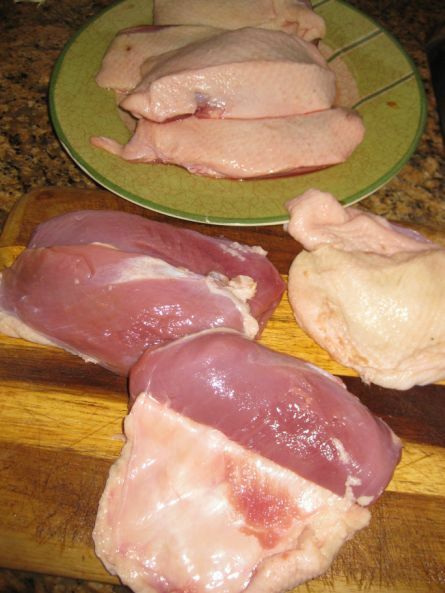 removing the skin from the duck breast. 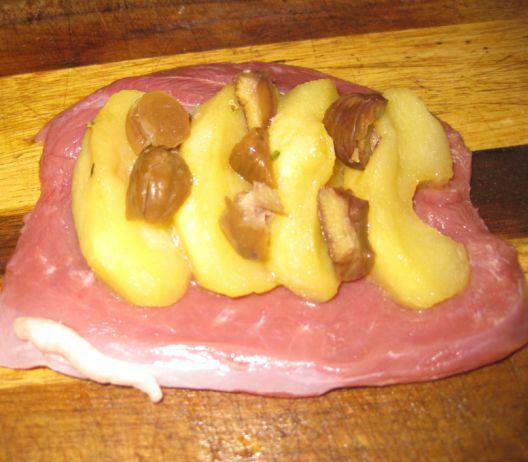 Place 4 roasted apples wedges in the center of the breast and fill in with the chestnuts. 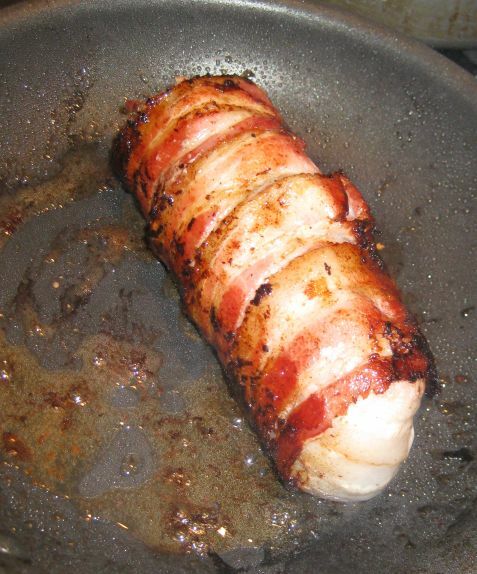 Fold the breast meat onto itself to form a roll. 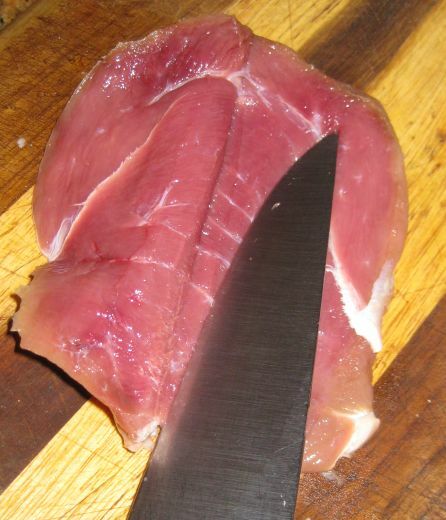 Place 4 lenghtwise overlapping slices of bacon on a work surface. 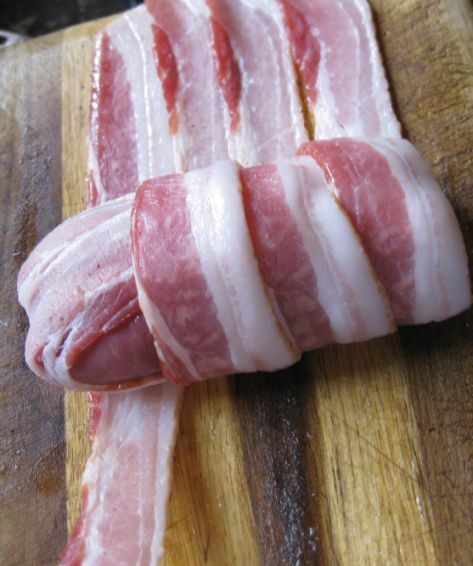 Place 2 bacon slice perpendicular to the 4 slices so they overlapped by 1 inch to form a cross. 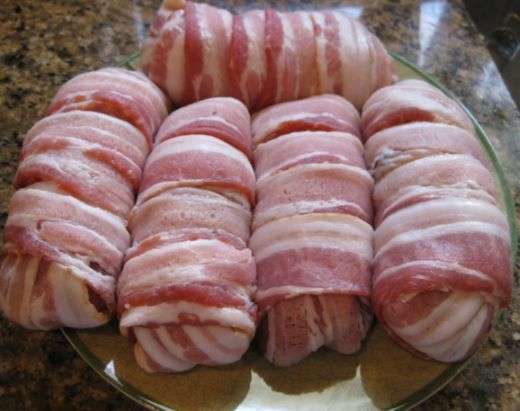 Place the duck in the center, parallel to the 2 bacon slices. 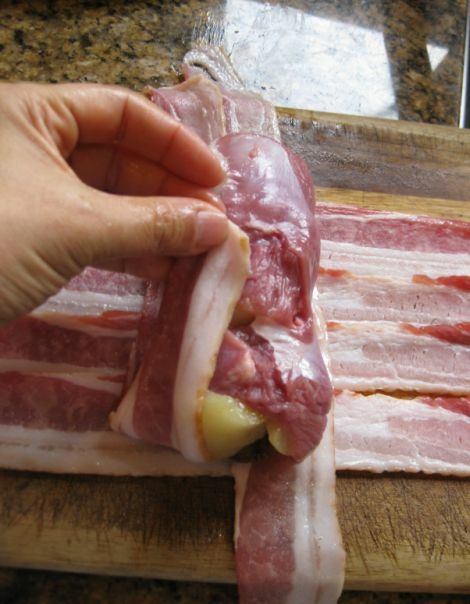 Fold over the bacon over the duck, then roll it up to form a neat package. 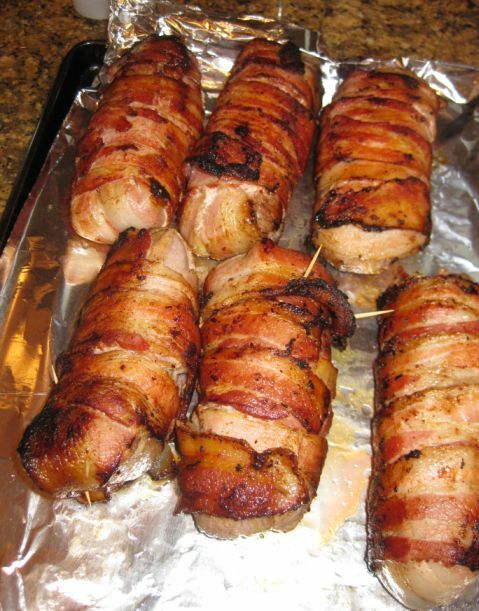 This is how the duck looks when it is wrapped in bacon. On a hot pan sear the duck breast on the seam side of the bacon first. 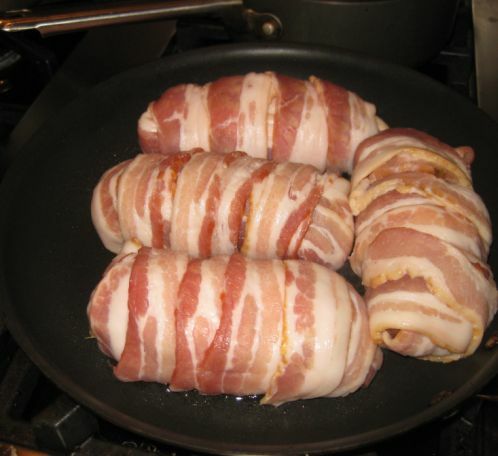 Rotate the package until the bacon is browned - about 6 minutes. Put the duck beast on a baking sheet - preheat oven to 375 degrees and finish the duck breast in the oven for about 15 minutes. Cutting the celery root into 2 inch pieces. 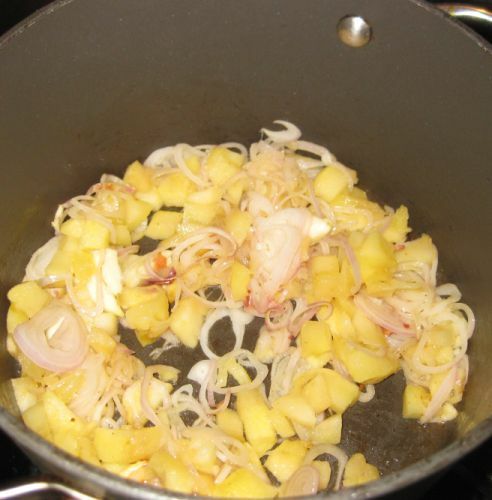 Put the celery root into a large saucepan with salted water. 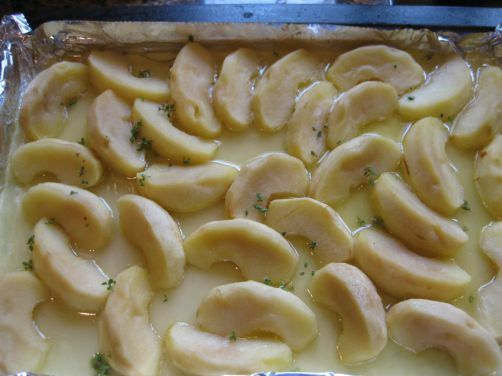 Add 2 tablespoons of butter and let it boil for about 20 minutes. 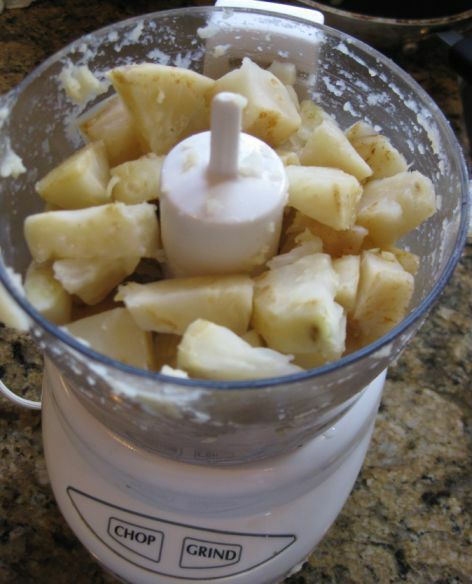 Once the celery root is cooked, put them into a blender with the remainder 2 tablespoons of butter. Puree until smooth and season with salt if necessary. Set aside. 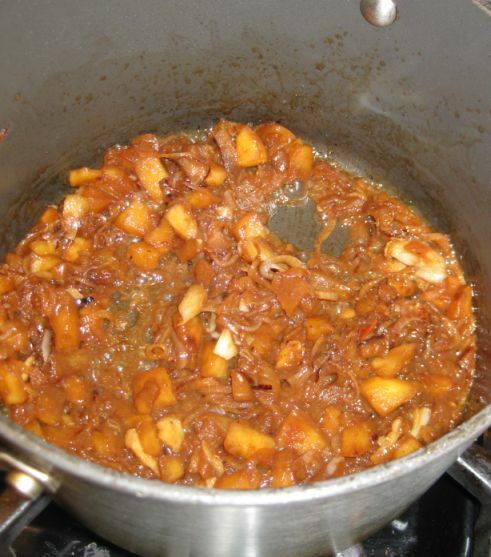 for the duck sauce: heat the olive oil in a saucepan, add the apples, shallots, and garlic and cook for about 6 minutes or until they begin to caramelize. 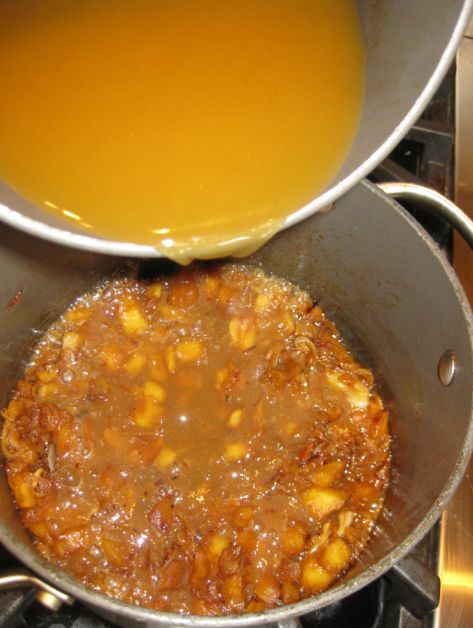 Add the brandy and increase the heat to high and cook until almost all the liquid has evaporated. Here you can see that all the liquid has evaporated. add the peppercorn. 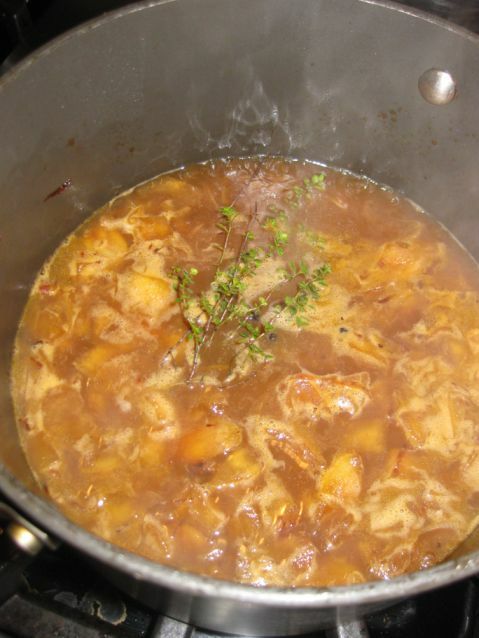 Add the thyme and simmer for 25 minutes. 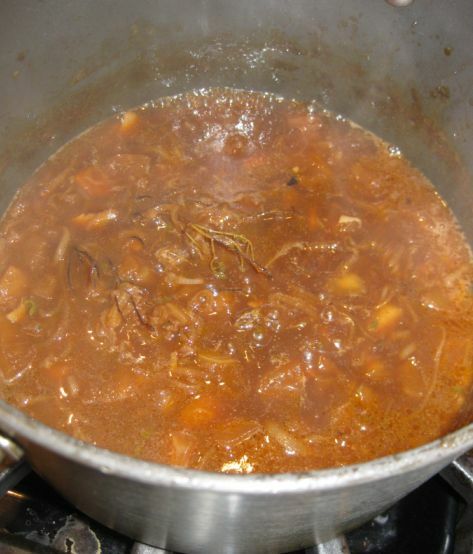 Once the sauce has thicken strain the sauce.